New Providence, Bahamas – It is often said that it is better to give than to receive. It’s a mantra that Bahamas Waste has adopted as part of its corporate citizenry, partnering with various community organizations including; Rotary International, All Saints Camp, Bahamas National Trust, The Bahamas Cancer Association, Bahamas Humane Society and most recently Voltar’s World Community Club on projects ranging from community clean-ups to youth development. 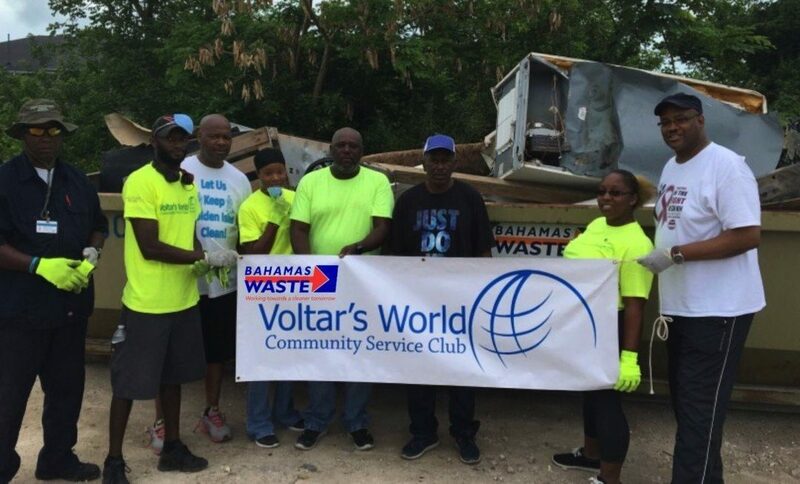 Voltar’s World, a service organization targeting inner-city communities, joined forces and honoured Bahamas Waste during a special presentation for its support of ‘Project: Exterminate the Waste’. The initiative which began last year with targeting coastal communities across New Providence has since moved inland and has been instrumental in removing hundreds of pounds of waste, debris, and trash from inner-city communities as well. The company has consistently provided collection bins, and protective gear to facilitate the club’s cleanup campaign along with financial support totalling over twenty-five hundred in cash and services. To show its appreciation, members of the Voltar’s World Club recently presented Bahamas Waste General Manager, Francisco De Cardenas and other members of the Bahamas Waste team with certificates of appreciation as well as an engraved plaque for their continued support. Voltar’s World was founded with the intention of addressing societal issues and is open to all individuals over the age of 18. Persons interested in becoming a part of the service organization can send their expression of interest to voltarsworld242@gmail.com or follow the club’s activities via social media at https://www.facebook.com/voltarsworld242/.